Although I had heard of a packraft before, they did not really catch my interest until I saw Greg Topf with one on the Wenaha last year. I was intrigued, but felt a little weary about their durability. When I met Greg, I was floating the Wenaha in an inflatable kayak. That was my third trip floating the Wenaha and each time has been with a different inflatable craft. The first time was in a small 8 foot pontoon boat. It worked well, but was a lot of work to get to the river. My second trip was in a Scadden Escalade with oar mounts. This boat is basically a small inflatable kayak, with small oars mounted on the tubes, and a hole in the front so you can stand up in the middle and fish or portage quickly around obstacles or over shallow gravel bars. The last float was in an Aire inflatable kayak. All three boats worked well once I got them to the water, but they are relatively heavy for hiking in places. The NRS packraft weighs in at a mere 4.8 pounds. That sounds nice for a pack in inflatable. At the end of our rafting season last year we decided to buy two NRS packrafts to try out and if they held up to my use we would rent them out at the store. I never had a good opportunity to test one out last fall but with last Sunday promising good weather and the need to pick up a rented raft in Troy at the end of the day, I thought there was no better time to hike up the Wenaha with an NRS packraft for a trial run. Jeff joined me as co-test pilot which gave me a much better opportunity to get some picture taking done as well. We headed out early and arrived at the Wenaha camping area near Troy mid-morning. With the two NRS packrafts we had picked up a pair of NRS Paragon Packs. The Paragon pack is a backpack harness system that allows you to attach a drybag and paddle to it. After putting the packrafts, inflation bags, lunch, and a few odds and ends into our drybags we cinched them into the Paragon packs and began fishing our way upstream. The Paragon packs worked well, but it felt like it was a little undersized for my frame. It worked well enough and I was pretty comfortable fishing my way upstream with it for most of the day. If a person had a good pack that fit them well, they would probably be better using it and carrying a big enough drybag that the pack would fit in, or simply strap the empty pack to the pack raft and let it get wet. In most situations you would not need to use the pack once you are to the river anyway, so it wouldn’t really matter if it became wet during the float back. The day was beautiful and warm and I had dressed with too many layers. The Wenaha had lost its crystal clear quality and gained a slight greenish blue hue from snowmelt. It was not too high to wade and Jeff and I fished our way upstream a couple of miles. We were both recovering from colds and not 100% healthy so we were not pushing it. We were simply enjoying the day out on the river. I could have been perfectly happy to walk up the canyon with my camera and then blow up the raft and float back to our vehicle. It almost felt like an early summer day it was so nice. Jeff spotted a bighorn sheep appear on the skyline and I got out my long lens to try and capture a few pictures. After a few minutes of watching the sheep a hiker appeared on the trail above us and the sheep ran out of sight. We decided it was getting close to time to inflate the boats and head back so we walked part way up the ridge to the trail to see if we could spot the sheep for some closer pictures and then walked upstream to Dry Gulch so we would at least have 3 miles to float back in the packrafts. From the time we opened our dry bags to begin setting up the rafts until we had them inflated, on the water, and our gear lashed down and ready to go was a mere 20 minutes. I thought that was pretty good for our first time. Directly downstream was a short wave-train and it felt a little odd having the drybag lashed to the front of the small pack raft. To be honest, when I hit the first wave the drybag began to come my direction and I wasn’t sure it was going to stop. It did of course and the packraft handled the wave fine. We zoomed past the next couple miles getting a feel for the small rafts. Less than a mile upstream of the parking area was a small rapid that I thought would be a good test for the packrafts and a good photo opportunity as well. We beached the packrafts and Jeff got in position to take some pictures. 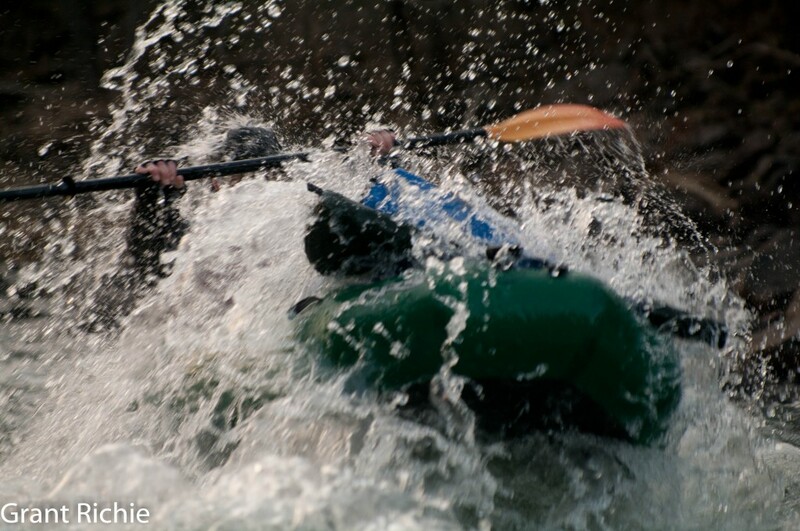 I honestly was not sure if the pack raft would handle the rapid. I had a small nagging feeling in the back of my mind that it might fold in half and sink when I hit the wave. But I was wearing a lifejacket and the river was wade-able a short distance down from the rapid so I wasn’t too worried. I lined up the small NRS packraft and punched the wave head on. I got a good soaking but the packraft handled it with ease. I eddied out laughing and walked upstream to take pictures of Jeff as he punched the wave with his NRS packraft. Again no problems. I was feeling a little more comfortable with the packraft by now and I decided I would carry it back upstream and do it a second time with the drybag off the front. With no drybag on the front the packraft became even more responsive and I ran the rapid a second time while Jeff took more pictures. Packrafts are fun. I am going to give these little NRS boats a thorough testing this spring and summer. The only downfall I see so far is the lack of a spray skirt, which NRS tells me they will have available later this year. With no spray skirt and splashy water, you will have to stop and dump the water out every couple miles. The NRS packrafts passed their first test. They handled a decent wave and did not pop running over shallow rocks. So far so good . . . This entry was posted in packraft, Wenaha. Bookmark the permalink. I read your review of the NRS Packraft with interest, and I am intrigued by the weight of just under 5 pounds. My present inflatable is a Sevylor K1 River XDS, which weighs 36 pounds, is self baling, has 400 pound capacity, and is totally controllable in big Class II water. Because of its kayak shape, it fits me (6′ & 190#) very well. I stow my gear behind the back rest, so I don’t worry about stuff coming at me from the bow. I am not sure if I am eager to pack it very far up river, but I would like to take it on stretches of the Deschutes and Sandy Rivers this year for some fishing. I think inflatable kayaks are certainly the way to go when it isn’t too hard to get them to the water. The packrafts are going to offer a great advantage for those hike in locations. I am still not totally sure how durable they are. I plan on testing them out on more floats to see what they can handle. Maybe I will do a Grande Ronde float with one just for the heck of it as well. It would probably be a lot of fun to go through the rapids in it. You forgot the part about having to sprint after the raft when it got away from you guys! I was up above on the trail and started running for it too, I had your back man. I have to say that I don’t think I’ve ever seen anyone sprint that fast in waders. I met you guys up there just before you blew up the rafts. I’ve been following your site for a while, but didn’t realize that was you until reading this. Anyway good luck to you, I’ll keep following your site. PS- I’m thinking about getting a switch rod. My thought is that an 11′ should do the trick on the GR and probably wouldn’t be overkill for the Imnaha or Wenaha. What do you think? That is too funny. You should have came down and you could have had a turn in the packraft going through the wave. We probably would have done it another time or two but the light was starting to fade. Jeff and I did a Joseph Creek float a couple weeks back, I in the packraft and Jeff in the inflatable kayak. I was very careful about securing my boat that trip after we nearly lost it on the Wenaha. I will post about our Joseph Creek float this week sometime when I finish going through pictures. On the switch rods, I would say you are right on. I bought one and built a few different 7 weights and here is my opinion so far. Stay away from the inexpensive St. Croix Imperial, it feels like a broomstick and is much more tiring to cast than the others. 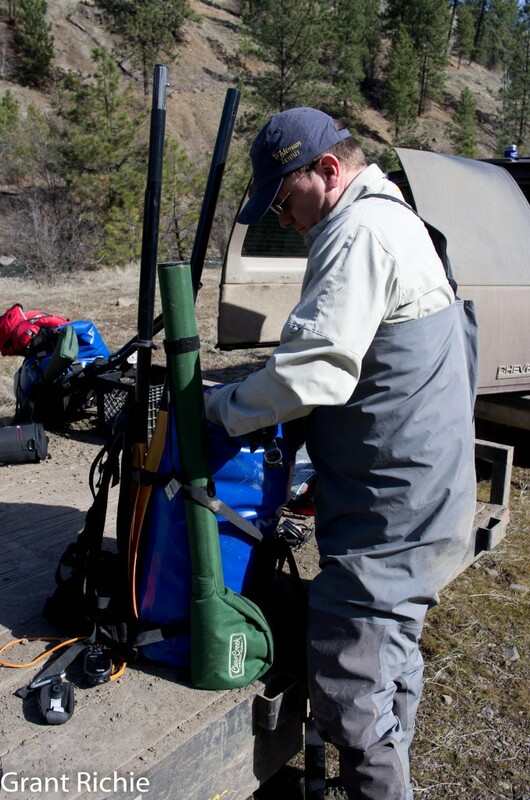 The Rainshadow RX7 is a great feeling rod and is perfect for the Wenaha, Wallowa, Imnaha. It felt like it could use a little more power on the Grande Ronde. 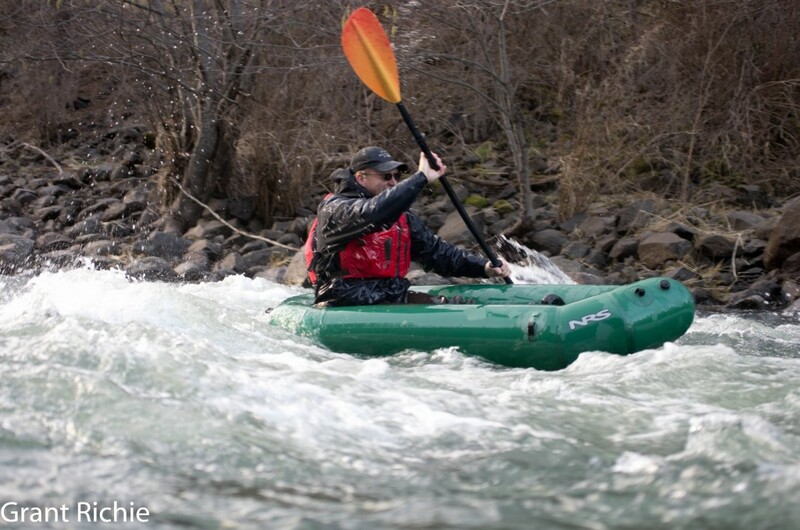 The Pac Bay Quickline feels great on the Wenaha and the bigger Grande Ronde. I thought the Quickline was the best so far, but the Rainshadow feels great for a smaller river. I have a Beulah that I haven’t finished up yet. I will let you know what I find when I finish it. For reference, I used a Rio Switch 7/8 line on all of these rods and fished 2-3 flies sometimes with split shot sometimes without. In some situations I will throw a thing-a-ma-bobber on there as well. If you were only casting one fly I am sure the Rainshadow would be fine on the Grande Ronde, so keep how I fish in mind when deciding what rod is best for how you like to fish. I was surprised how quick I could run in the waders! Good thing I happened to look downstream at the correct moment. Those packrafts are so light that if a breeze catches them they can almost fly away. I’ve certainly done the ol’ run down the river bank scramble, trying to catch back up to my pontoon (more than once). It’s amazing how motivated you get when about $1000.00 goes floating past you in mid cast. Anyway, thanks for the advise on the rods. I’ve also looked at Temple Fork Outfitters and have been pretty impressed with their 11 footer. Keep it up with the awesome website!